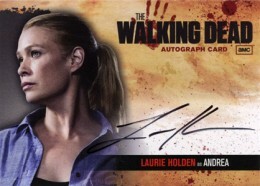 Even better than the first set, the 2012 Cryptozoic The Walking Dead Season 2 autographs checklist includes nearly all of the main cast. It adds the notable omissions missing from the Season 1 set and gives collectors a second chance at some of the bigger names. 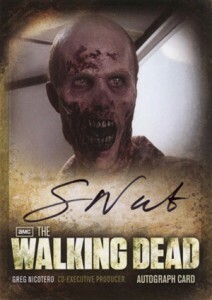 Few trading card sets achieve the instant runaway popularity that Cryptozoic's first Walking Dead set enjoyed. Within a couple of months, box prices essentially tripled and now nearly run $150 to $200. Season 2 doubled its suggested retail price well ahead of its release date. Several factors can account for this, but the autograph lineup is certainly one of them. 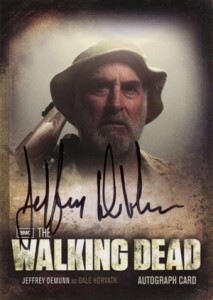 The 2012 Cryptozoic The Walking Dead Season 2 autograph checklist includes a pair of big names signing trading cards for the first time. 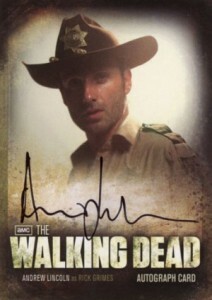 Andrew Lincoln plays Rick Grimes, the central character in the show. Sarah Wayne Callies, who also starred in Prison Break a few years back, plays Lori Grimes. 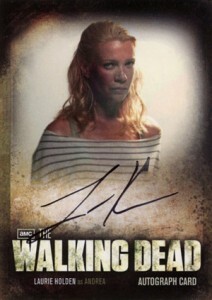 Laurie Holden (Andrea), the other lead star missing from Season 1, is also in the set. 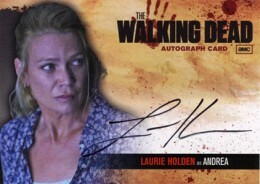 Not only that, but a pair of Holden autographs have been added with the Season 1 style, filling in the holes in the checklist. 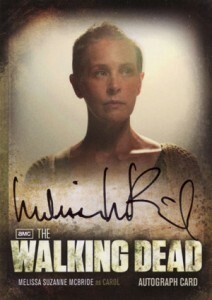 She has a previous autograph in 2001 Inkworks X-Files Seasons 4 and 5. 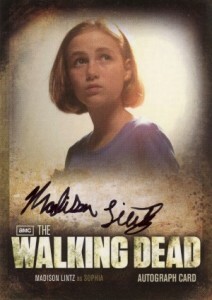 Other new signers for Season 2 include Melissa Suzanne McBride (Carol), Madison Lintz (Sophia), Scott Wilson (Hershel) and Greg Nicotero (Co-Executive Producer). 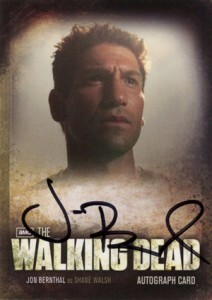 Among the returning signers are Jon Bernthal (Shane), Steven Yuen (Glenn) and Norman Reedus (Daryl). All autographs have a new design. The new look is vertical and has lots of black, giving them a darker feel as well. They look as though you're staring up from the bottom of a grave. 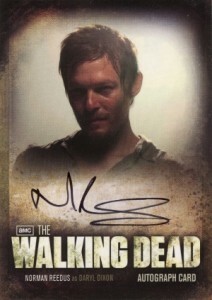 Autographs fall one per box in 2012 Cryptozoic The Walking Dead Season 2. 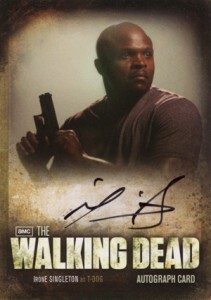 Below is a complete look at all of the confirmed autograph cards for the set. 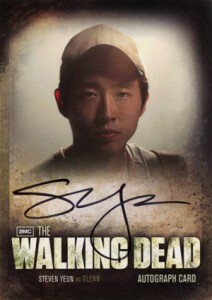 As a policy, Cryptozoic doesn't announce signers until the signed cards are in-hand. This could mean additions before the set releases in November. I’m doing a pee-pee dance! If you love or loathe zombies as much as I do, be sure to check out 20 of the Greatest Zombie Movies of All Time reviewed at http://dregstudiosart.blogspot.com/2011/05/top-10-zombie-movies-of-all-time-with.html with some really cool zombie artwork! 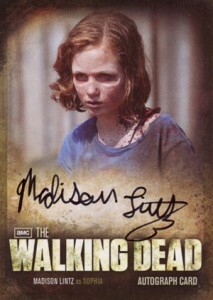 There should be a variation auto of the A7 Madison Lintz as Sophia auto with her coming out of the barn! houdini (ID 68784) � You never know. 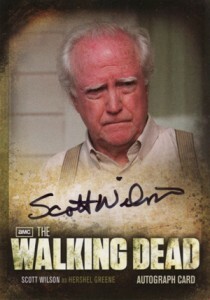 The Season 1 set had two different versions of each signer. Still a few holes in the checklist.